Kids are given 1 learning set every month which includes learning tools and books. Workbooks are important elements that connect all subjects. All books are written in Vietnamese and English. Jello Math includes 36 learning tools (1 math tool each month for 3 years) and workbook exercises help kids to be exposed to and practice mathematic concepts in a fun and exciting way. 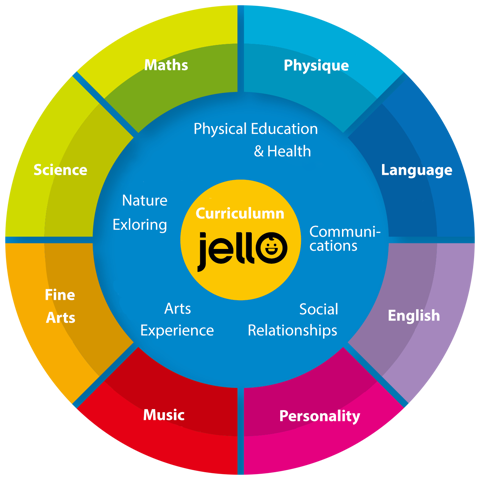 Jello Science includes 144 science experiences (1 experience every week for 3 years) providing kids with basic science knowledge through creative activities. Kids have a chance to practice comparison, classification, observation, speculation& critical thinking. Jello Music includes 36 musical instruments (1 musical instrument each month for 3 years) specially designed for music teaching in kindergarten. Jello music aims at teaching kids to play simple instruments and discover musical talent in them. Kids get to know concepts such as sounds, harmony, genres and practice reading music sheet and playing instruments. Jello Art includes art & craft activities in workbooks that teach kids about space, time practice their hand muscles and eyes. It also helps develop fundamental engineering skills. Jello Physical Education includes 36 learning tools (1 math tool each month for 3 years) with exercises that help kids become healthy, happy and full of energy. Various motion exercises will help kids build stamina, balance and motor skills. Jello Personality includes 36 bilingual English – Vietnamesspersonality books and extra lessons in workbooks that help kids learn about their emotions and feelings and others. Kids will learn to respect others, care about people around them and gradually becomes well-mannered individuals. Jello Language includes 36 language books and extra lessons in workbooks that help to build language ability for kids. Jello English includes English exercises that will prepare kids for elementary school. In our curriculum, kids will learn the alphabet, phonics (pronunciation), develop critical thinking & confidence in communications.